Black and white Spooky themed pin badge. 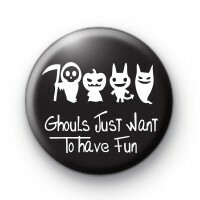 This 25mm badge has the slogan 'Ghouls Just Want to Have Fun' and a lineup of creepy, spooky ghouls and ghosts. It is a fun badge to add to any Halloween celebration. It will help you get into the fright night spooky spirit.